Esta cinta tuvo mucha promoción, al menos en el Moving Picture World. Producida por Méliès, la historia es bastante banal como lo puede comprobar el lector al leer las reseñas de la época y las fotografías. Es de notar que tuvo una portada, una contraportada y un par de reseñas. 1206 / 59. 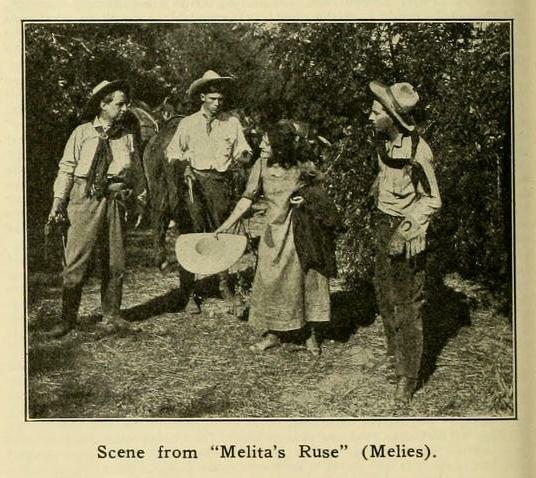 Melita’s Ruse (1912). P: EU, Méliès. 1 rollo. Se supone la presencia de mexicanos. Según la página del IMDb, Melita’s Ruse fue dirigida por Gastón Méliès, hermano de Georges y la protagonizó Francis Ford. Fue estrenada en Estados Unidos el 22 de enero de 1912. MELITA’S RUSE (Melies). Good photography and impressive mountain scenery form the principal charm of this latest Melies offering. 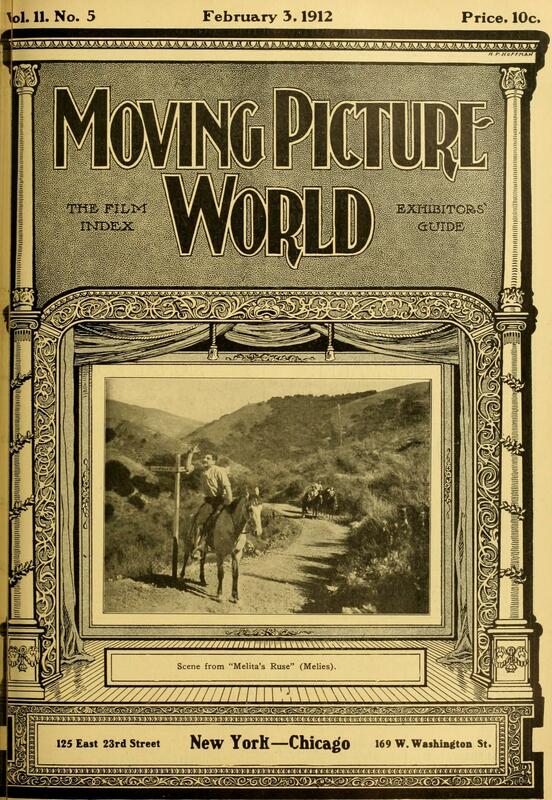 The story of the picture is of secondary interest and cannot be considered a dramatic masterpiece, but the photography and scenes pull it through. The idea of the story is based on the well-known theme of an innocent man who takes flight for the unlawful action of another and thereby becomes a fugitive and an outlaw. In moving pictures this situation sometimes makes one impatient at the lack of judgment shown by a man who will run away when some other man makes a gun-play. But the fact remains that it is a thing that occurs very often and has always been a part of human nature. To the spectator it usually seems a foolish thing to run away at another’s misdeed. But that is because the spectator does not place himself in the other man’s place. Some men are excitable: they act upon impulse and never view the situation in a calm way until it is, perhaps, too late. It is safe to say that nearly every man who reads this will remember a time when, as a boy, he fled when some other boy threw a stone through a window. The boy who throws the stone seldom gets caught; but it is usually some unoffending boy who fled, upon impulse, with other boys, and being caught he bears the full blame. Such, in a general way, is the idea of Melita’s Ruse, except that Melita is a girl, the sweetheart of Pedro. She assisted Pedro when he became a fugitive in a serious case with which he was not connected. He ran away when there was really no need of his doing so. But, as we have said, some men get excited and act upon impulse, and thereby hangs the tale. Pedro’s sweetheart by a clever ruse assists him to escape across the American border into Mexico where Pedro is apparently obliged to pass the remainder of his days. The successive scenes are exceedingly pleasant to look at and the picture will pass muster on that account. One scene is particularly irritating: that of a prisoner escaping through a window while three guards directly outside of it are so interested in a card game they do not see him. The only excuse that could be given for the man to get out of such a predicament would be that the three guards had suddenly gone stone blind and deaf at one stroke. Why do producers do these things, when even little children notice the absurdity of them? MELITA’S RUSE (Melies), (Feb. 22).—In a Western saloon Pedro and the boys are playing cards and drinking, when one cheats and there is a gun fight. It all happens so quickly that no one knows who to blame until Pedro, knowing that he shot at least one man, steals quickly from the place and rides furiously off. The others see him go and at once decide he started the fight and is responsible for the probable loss of life. They mount their horses and pursue him. Meanwhile Pedro has succeeded in reaching a spot not far distant. 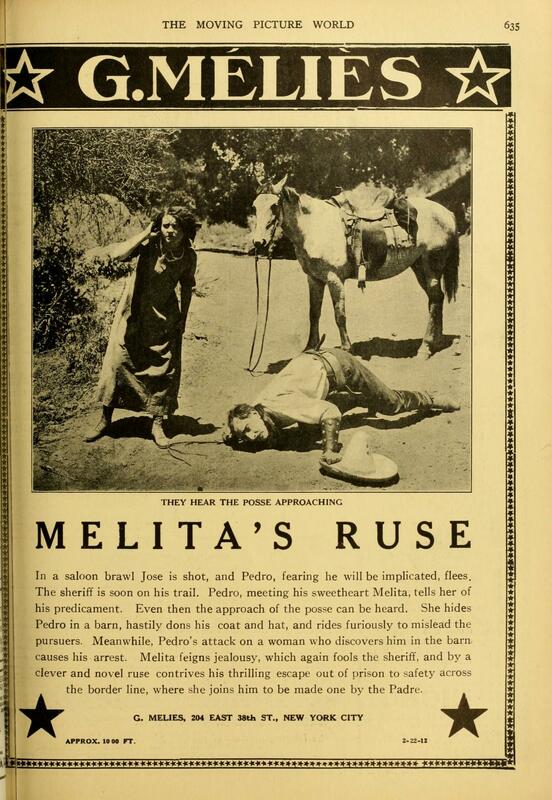 Here he meets his sweetheart, Melita. They both hear the approaching pursuers, and Melita, fearful for her lover, jumps on the same horse and they ride away. Reaching a barn, Melita changes clothes with Pedro, and after telling him to hide in the barn she rides away to mislead the pursuers. They follow her thinking her Pedro, but at last find out their mistake when they overtake her. Forcing her to go with them they search farther and find Pedro in the barn just after he has subdued a young girl and her mother who had entered to collect eggs. Pedro is imprisoned in the sheriff’s house as there is no jail in town. Melita frees him in a novel way and bids him fly to Mexico. The sheriff suspects Melita knows Pedro’s whereabouts and she, offering to show them where Pedro lives, leads them there, knowing he is even now on his way to Mexico. Returning to town in disgust with Melita accompanying them, they are just in time to see, with the aid of a field glass, Pedro crossing the boundary in the valley below. A week later Melita receives a letter from Pedro asking her to join him that the Padre may make them one.